Is Samsung's WiFi-only tablet rugged enough? With a battery that can outlast your flight and a form that keeps it safe from snow, the Tab Active is beset by a small hard disk, no cellular option, and an inability to survive multiple falls. As the modern small business continues to incorporate new technology into their workflows, tablets have begun to supplement notebook computers. The iPad Air 2 ($499, £399, AU$619) is still the flashy king of the tablet world, but with Apple's reputation for building units that shatter too easily, a need exists in the market for a battle-tested tablet. 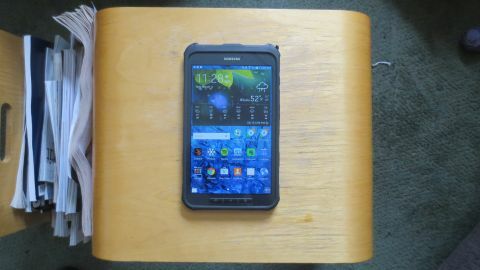 In comes the Samsung Galaxy Tab Active, one of the first built-to-be-tested, yet inexpensive tablets. Sure Panasonic has the Toughpad FZ-M1, but that's a Windows 8.1 device that will run you $2,099 (£1,183 or AUD $2,358). Not exactly a viable option for the office klutz limited to a tablet-sized budget. Beyond that, tablet manufacturers have not offered many viable enterprise options, so the Tab Active is best compared to mid-tier consumer tablets, especially if you consider that Samsung sells the 8.0-inch Tab Active for $699.99 (around £465 and AU$907). That's with a 16 GB hard drive, and if you went to Apple or Google for a mini tablet with the same disk space, both the 7.9-inch iPad Mini 3 and the 8.9-inch HTC Nexus 9 start at only $399 (around £265 and AU$517). If you take off the hard shell-style protective case that the Tab Active comes sold in, you'll see that at the core of the product is a tablet computer just as fragile-looking as the competition. Luckily the tablet comes out of the box already in the case, sending a message you won't need to ever break these two up. The case, which is of a hard rubber material, gives you an easy grip, and the slot for the Samsung C-Pen stylus is placed at a convenient location, and built well enough to make the stylus stay in place. The ports at the bottom of the Tab Active are also designed with durability in mind. Micro USB 2.0 is a port I've long groaned at upon sight, but the build quality of this port is great. I would never once worry about it breaking, something I can't say about any of Mophie's current mobile battery cases. The screen is OK, not great, but that's a quibble in comparison to the one major design faux pas found in the Tab Active. If you're looking to play audio, the Tab Active better not be lying flat against a surface, since that will muffle the sole speaker, placed on the back of the unit. The Tab active weighs in at 0.84 pounds (0.39kg) and measures 4.97 x 0.38 x 8.39-inches (12.62 x .975 x 21.31 cm) (W x D x H). However, in the case, it measures closer to 5.125 x .5 x 9.0-inches. That's slightly less bulky than the Toughpad FZ-M1, which weighs in at 1.19 pounds (0.54kg) and measures 0.71 inches (1.8 cm) thick. At the same time, it's bulky in comparison to both the iPad Mini 3, which weighs 0.73 of a pound (0.33 kg) and measures 5.3 x 0.29 x 7.87-inches (13.47 x .75 x 20 cm). Admittedly, the Nexus 9 may be heavier and larger, weighing in at 0.95 pounds and measuring 6.05 x 0.31 x 8.99-inches (15.37 x .79 x 22.83 cm), but it's still slimmer, and owes those other measurements to a screen that's unmistakably larger.